The “American Painting and the Florida School of Art – Selections from Private Collections” exhibition at Stetson University opens to the public Friday, May 13, and continues through July 2 at the university’s Hand Art Center. The public is invited to the Opening Reception, Friday, May 13, 6-8 p.m., at the Hand Art Center, 139 E. Michigan Ave., DeLand. Exhibition guest curator Gary Libby stands next to “Landscape South of Englewood, Florida,” a painting by Lois Bartlett Tracy (1901-2008). The largest gallery at Stetson University’s Hand Art Center was dedicated as the Gary R. Libby Gallery on May 4. 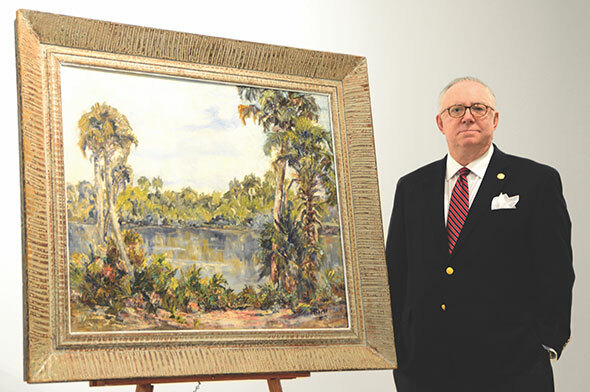 Its namesake marked the occasion with one of his passions: paintings from the Florida School of Art. Libby, a former Stetson trustee and assistant professor in art history, English and the humanities, is curating an exhibition at the gallery now bearing his name. The exhibition, “American Painting and the Florida School of Art – Selections from Private Collections,” contains 40 works dating from approximately 1825 to 1925, including pieces by renowned landscape artist George Inness, Ash Can School realist painter Robert Henri, Highwaymen painter Harold Newton and others. The gallery naming is “a thank-you,” Libby said, for a bequest he made to the university and specifically the Hand Art Center. The undisclosed gift will enhance “the future of the visual arts at Stetson,” said Libby, who is distantly related to Richard M. Libby, the husband of Stetson President Wendy B. Libby. The exhibition, in turn, will enhance the recognition of a concept he has championed throughout much of his latter career — promoting the worthiness of Florida art, Libby hopes. “While this exhibition is just the tip of the iceberg, I think it helps to justify why Florida painting is finally being viewed as an important school of art,” said Libby, who is Director Emeritus of the Museum of Arts and Sciences in Daytona Beach, where he served as director from 1977 to 2002 and from 2004 to 2006. Libby defines a “Florida painting” as “Florida subject matter — a representation of Florida by an artist who, whether he lived here or not, felt his inspiration in Florida. And 90 percent of them were done in the state.” The exhibition also includes works by artists who taught or influenced Florida School painters but who are not part of the school, hence the inclusion of Robert Henri. The Hand Art Center operates Monday through Friday, from 11 a.m. to 4 p.m. For more information, contact the Hand Art Center at 386-822-7270, or visit the website at www.stetson.edu/hand. A preview of the exhibit can be viewed in this Flickr album.